We hypothesized that blue tang, Acanthurus coeruleus, territories on sites with low biogenic structure would be larger than territories on sites with relatively high biogenic structure due to differences in the amount and distribution of resources. We tested this hypothesis by tracking blue tang over uncolonized pavement and reef crest, two habitat types at opposite ends of the habitat structure spectrum. We recorded density, feeding rates and aggression events in order to evaluate our findings in the context of a territory model and the ideal free distribution model. Territories of A. coeruleus averaged nearly four times larger on pavement sites than on reef crest sites. Conversely, densities of A. coeruleus were significantly lower on pavement sites. While there was no significant difference in the average rates of movement between habitats, average turning angles were significantly higher on reef crest. 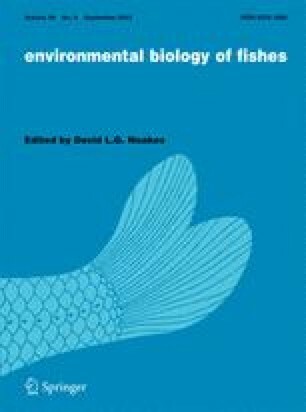 There were no significant differences in feeding rates between habitats, suggesting that higher territory sizes and lower densities may allow fish on uncolonized pavement to match resource acquisition of fish on reef crest. The insignificant difference of aggression encounters between habitats suggests that movement and density differences among habitats are not solely legacies of differential settlement.